GVF or better, mounted as worn & complete with London gazette details. 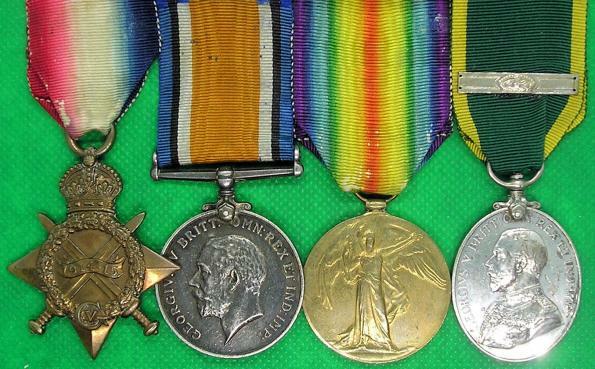 Mint boxed 1939-45 star, France & Germany star, Defence medal, 1939-45 War medal & GVIR 1st type territorial efficiency medal. Rare to find a medal named to both units. The recipient served with the 2/6th & 9th Duke of Wellingtons West Riding Regiment and was a resident of Skipton, Yorks. George Edwin Fleming was born in Portsea, Hnts 6-11-1888 and joined the RN 6-5-1907. He was awarded his LS&GC in 1922 having served on a large number of different ships. He was still serving in 1929. GVIR 1st type GSM 1918-1962 with clasps for Palestine, Palestine 1945-48, Malaya & Near East, 1939-45 star, France & Germany star, Defence medal, 1939-45 War medal & GVIR 2nd type regular army LS&GC to, 4905121.WO.CL.3 / SGT.J.MAIN.SOUTH.STAFFORDSHIRE.REGIMENT. I can only confirm the pre war Palestine clasp on the available medal rolls but the rivets are clean & tight and the group is mounted for wear. Albert.W.Galpin was born in London 18-2-1895 & Served with the H.A.C Infantry During W.W.1. He was commissioned in to the R.A.S.C in 1919 & by the outbreak of WW2 was a Lieutenant Colonel on the general list. Complete with WW1 MIC card, London gazette details & copy P.O.W card details. GVF or better & complete with both MIC & medal roll details. George Kershaw first landed in France 16-4-1914 & was awarded his territorial force efficiency medal in 1919 with the 2nd award clasp following in 1924. John.T.Bramald enlisted 6-10-1914 & first landed in France 19-8-1915.He was discharged with a silver war badge due to sickness 9-8-1917 but re-joined his old unit post WW1. Mounted as worn & complete with two sterling silver & enamel regimental sports medals that are both named to the recipient & dated 1925 & 1926. GVF/VF & complete with MIC & medal roll details.